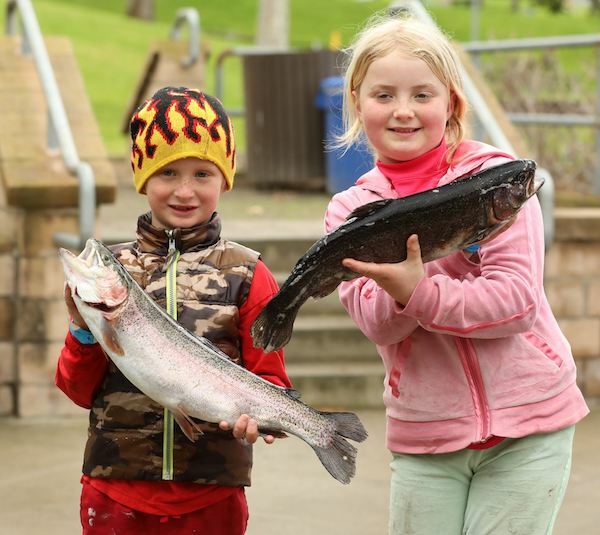 The 24th Annual Youth Fishing Derby was a huge success! The rain held off for most of the morning allowing kids to reel in a lot of trout. Thanks again to our sponsor Poway Chrysler, Jeep, Dodge, Ram for making this amazing event possible. 1st Place in the 7 and under division went to Dylan with a 4.31-pound trout. 1st place in the 8 to 11-year-old bracket was taken by Logan and Aiden at 5.39 pounds, and 1st place for 12-15 year olds was David with a 5.59 pound Tailwalker. Kids also enjoyed games and a terrific comedy magic show performed by Extreme Rahim, and everyone enjoyed free hot dogs. In addition to the great prizes for the big fish there was also a raffle that included over 50 rod and reel combos. Thanks to Lake Poway Concessions for donating the rods and thank you Mike Long for hosting. Next stock: February 13th, 1,500 pounds of Tailwalkers. When you stop by concessions to buy your permit ask about the best spots and baits. They have up to the minute information. Remember concessions closes at 4:00 PM so come early enough to buy your permit or rent a boat. Lake Poway Hours: 6:00 AM-5:30 PM. Boats in by 5:00 PM. Closed to boating and fishing Mondays and Tuesdays.